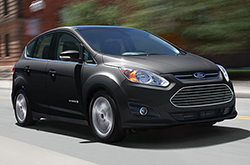 The 2016 Ford C-MAX Hybrid and C-MAX Energi plug-in hybrid continue to be excellent gas-alternative vehicles. Both models are largely unaltered for the new model year, aside from the addition of two fresh exterior paint colors and Ford's new SYNC 3 infotainment system. Equipped with excellent technologies that improve the driving experience and enhance safety, C-MAX Hybrid and Energi are perfect options for eco-friendly drivers. They also offer responsive handling and quick acceleration, which you can learn more about in our 2016 Ford C-MAX review below. 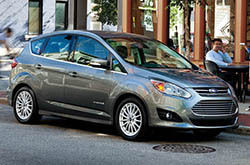 Coming into 2016, the Ford C-MAX Hybrid and C-MAX Energi receive additions to their exterior color palettes. The models are now available in Shadow Black and Kona Blue, which spice up their appeal. In addition to these modifications, the C-MAX also now comes with Ford's brand-new SYNC 3 infotainment system, which offers quick performance and easy communication. Complete with voice recognition, navigation, smartphone integration and steering wheel controls, the system is an excellent standard feature and greatly benefits both C-MAX Hybrid and Energi drivers. Additional available features, including HD Radio, Sony Audio and push-button start, take the 2016 C-MAX in Grapevine to new heights. Both the C-MAX Hybrid and C-MAX Energi are powered by a 2.0L four-cylinder engine, electric motor and lithium-ion battery pack. Each variant pumps out a total of 188 horsepower and delivers high-end performance. When tested, the 2016 C-MAX Hybrid in Grapevine could go from zero to 60 mph in 8.1 seconds, while the C-MAX Energi could jet from zero to 60 mph in 7.8 seconds. The Energi model also produces an EPA-estimated 38 mpg combined, while the Hybris delivers an EPA-estimated 40 mpg combined. To find out more details about the new 2016 C-MAX and its collection of first-class features, continue reading our 2016 C-MAX Hybrid and 2016 C-MAX Energi review. The 2016 Chevrolet Equinox, Nissan Rogue and the Toyota Prius V are beat out by the 2016 C-Max in several areas. The C-Max's marvelous looks, useful incar technologies and cut-rate sticker price are sure to win over TX shoppers. It's a truly outstanding value, which you'll definitely see when comparing its price to the competition. Browse our Quick List under this text to find out more! 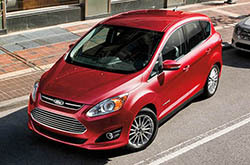 The Ford C-Max review above, along with overviews of earlier models and other 2016 Fords, will help make finding your next car quick and simple. As the leading Ford franchise in Grapevine it is our obligation to provide our customers with reviews recorded by the top Ford writers around. Information you can rely on to make smart decisions is right here - each paragraph is up to the hilt with invaluable information and specs. After viewing Grapevine Ford's review of the new C-Max, phone us to make an appointment for a test drive and find out about limited-time dealership offers!